Use our door lock integration? If so, every booking will have a unique code automatically generated that will open the door lock at the property. But you need to tell the guest what their code is. To do that, create an email template in OwnerRez with the below subject and body, and then create a trigger that sends this email template a certain number of days before arrival. If you only have door lock integration configured for certain properties, make sure the trigger is configured to only send for those properties. That's what the lock looks like on the front door of the house. Follow the below instructions to know how to operate the door lock. Print this email and take it with you! Note: Press the "Schlage"" oval button at the top of the lock to turn on the keypad back-light if necessary. 1) If it's dark outside, press the "Schlage" button at the top which will temporarily light up the keypad so that you can see. 2) Enter your code into the keypad. 3) After hearing the ascending tone and while the "Schlage" button is flashing green, turn the lever within 5 seconds to unlock the door. 4) Door will automatically re-lock behind you. Remember this as you enter and exit the house. Keep your code with you at all times. You can also use the instructions below to set your own personal code. 5) To set the door to stay unlocked, rotate the inside thumbturn to the vertical position. It's that simple! If you have any trouble, give us a ring, or reply to this email. Below are some additional features which you can use to make the process easier or understand what the lock is telling you when it blinks or makes noises. 1) Choose a 3-6 digit personal code to use during your stay. 2) Enter the above 10-digit access code. 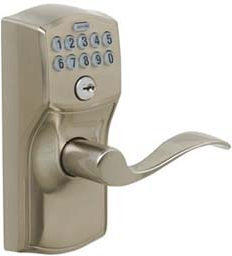 3) After hearing the ascending tone and while the "Schlage" button is flashing green, immediately (within 10 seconds) press the "Schlage" button and key-in the 3-6 digit personal code of your choice, then press the "Schlage" button to finalize your personal code. b. If your personal code has been used by another person, you will hear the descending tone and see the "Schlage" button flash red. In this case, please try a new personal code. 1) Enter your personal code. Each digit must be entered within 10 seconds. 2) Press the "Schlage" button. Following is the light & sound indication about operation status. Correct Operation The lock will beep ascending tone and flash green light.